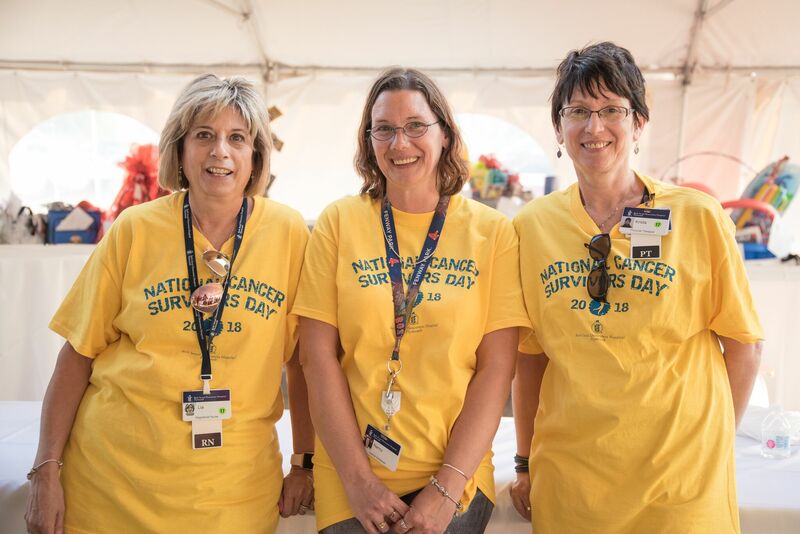 On beautiful sunny day in June, a record-breaking 550 cancer survivors, their families, and caregivers gathered under a jam-packed tent on the campus of BID-Plymouth to celebrate National Cancer Survivors Day. This year marks BID-Plymouth’s ninth year hosting National Cancer Survivors Day and included an afternoon of good food, entertainment by the band Despite Dwight, whose drummer is Dr. Matt Koomey, Medical Director of the Cancer Center; radiation oncologist and bagpiper, Dr. Joe Barthold; harpist Katie Lynch Koglin; face painting and photo booth by cancer center staff; and free chair massages. Jordan Rich, formerly of WBZ-AM’s Jordan Rich Show, served as the Master of Ceremonies—keeping the crowd entertained throughout the event with trivia questions and raffle prizes. Special guests included, Natasha Verma, NBC Boston News Anchor, Cancer Survivor, and Founder of Put a Cap on Cancer and Joe Andruzzi, former New England Patriots Offensive Guard, three times Super Bowl Champion, Cancer Survivor and Co-founder of the Joe Andruzzi Foundation. Despite their adversities, cancer survivors’ face each day with courage and dignity and serve as an inspiration to all of us,” said Cunningham.